Our permanent exhibit is reminiscent of school rooms across the country in the early part of the 20th Century. 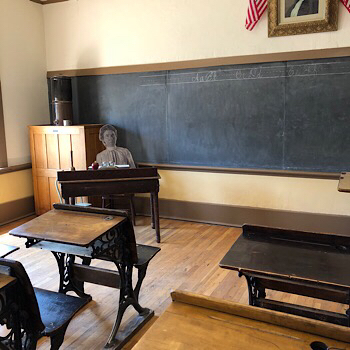 The high ceilings, large double-hung windows, school-house lights, slate blackboards, and ornate desks all speak to a different era in education. An exhibit created in conjunction with the Smithsonian Institution's Journey stores, Wish You Were Here tells the compelling stories of how we came to be in La Plata County. Opened in the Fall of 2012, Law and Disorder tells the true story of life in the Wild West. Meet T.J. McCluer, Jr., the sheriff of La Plata County and see some of his belongings. Learn about the cowboys that roamed the valleys and the bitter feud that rivaled the Hatfields and McCoys. Hangings, shootouts, bank robberies -- we have it all! In conjunction with the tenth anniversary of the Missionary Ridge fire, the Animas Museum updated this exhibit to tell how fires have changed the county. We are excited to announce that the gallery is re-opened after some major renovations. Visit and learn more about the Basketmaker peoples that lived in the Animas Valley. Also in the Main Gallery is our newest exhibit on World War I in La Plata County, which opened in June of 2017. Download .pdf files for Historic Downtown Durango ,the Third Avenue Residential District and the Animas City Walking Tour.